The 44thKAMA Annual Convention 2018 will be in Las Vegas, NV, October 12 to 14. We, the Executive Committee, would like to invite everyone to attend. The registration and hotel reservation links are listed in www.kamaus.org. The committee is working hard to make this convention the most educational and enjoyable, thus contributing to the unity and continuity of KAMA as an organization. Why should we attend KAMA convention? KAMA started out as fledgling social organization struggling for academic acceptance in 1974. After 44 years and counting, we now represent over 18,000 Korean American physicians of diverse background. Some of us are academic superstars, many serve the growing Korean American community in metro areas, while some of us practice in deep Americana. What unites us is the Korean heritage of strong work ethics, pursuit of the best in our endeavors, and appreciation for connections, which were deeply instilled by our parents, and which we will pass onto the next generation. 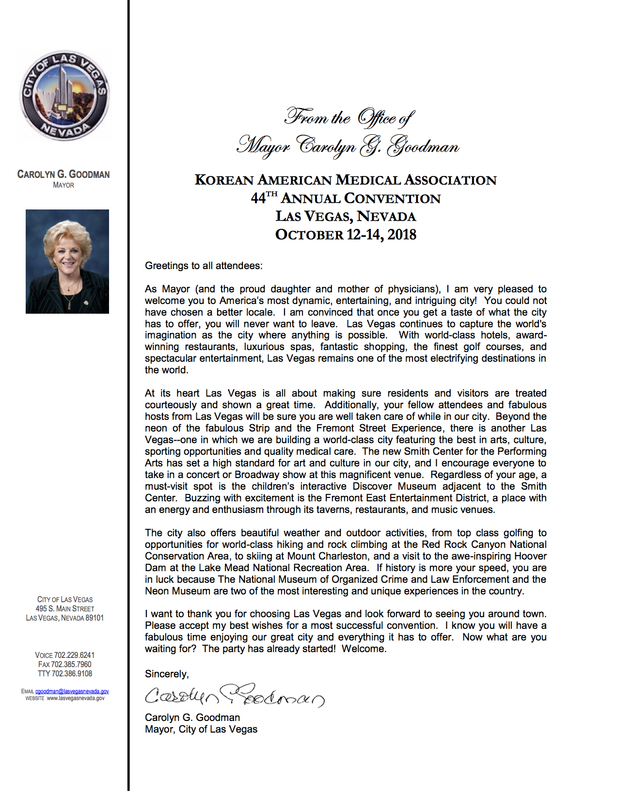 On top of presentations by Korean American physicians from academic forefront, we will feature speakers of various interesting topics such as practice management; current medical economics; medical informatics; family finances; Korean American community leadership; and giving back to society, and more. Families will be able to attend non-academic presentations; there will be organized outings for golf and tennis; and Saturday’s gala will be headlined by well-known Korean-American comedian/entertainer Henry Cho. Most importantly, we attend this convention because we enjoy one another’s company. The committee is working diligently to ensure enjoyable experience of attendees and families. This year, we feature “Friends of KAMA” registration category, which will form the basis of KAMA leadership, and we are actively seeking sponsorship from various industries and organizations. So please spread the words, come to Las Vegas, learn, enjoy, and help us make this the most successful convention for KAMA families.